Two days ago, the lifeguard at our local pool rescued a frog from the pool skimmer. Based solely on looks, I have unscientifically identified the little darling (the frog, not the lifeguard) as one of two Gray Treefrog species native to Virginia. 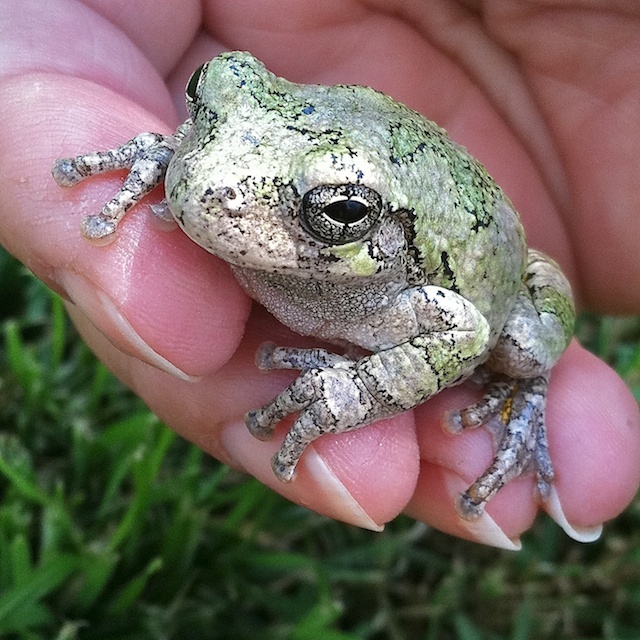 According to the Virginia Herpetological Society, the way to distinguish the Gray Treefrog, Hyla versicolor, from the very similar-looking Copes Gray Treefrog, Hyla chrysoscelis, is by their found location and their different calls. My friend was silent, so, because of our location in the state, I’m going with Hyla versicolor. Without a doubt, this beautiful little amphibian is one of the most endearing, gentle creatures I have ever had the pleasure to see and hold. I was completely bewitched by the little froggy’s charm and expression. And, my found friend had the most sublime, silvery and green glimmery, shimmery skin… almost ethereal. And under froggy’ arms and legs was a rich, golden-butternut color. I do worry about my froggy friend because pool chemicals are dangerous – often deadly, in fact, to many animals. 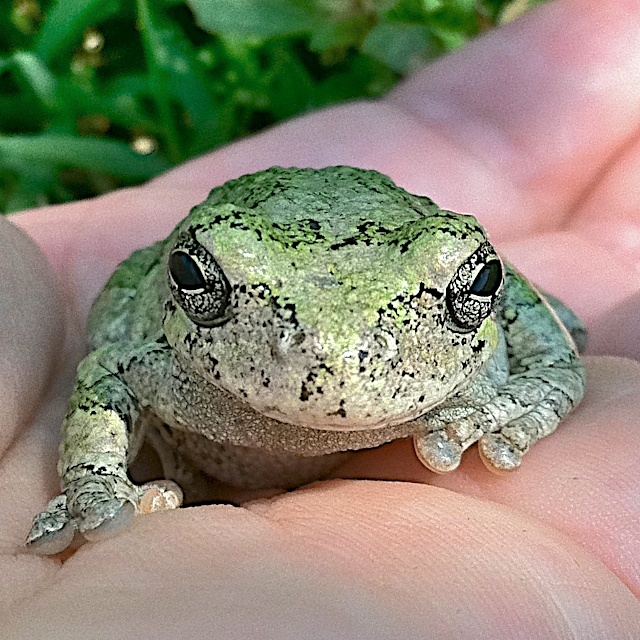 I learned many years ago while working on an environmental education program that amphibians are especially sensitive to environmental changes and toxins. Scientists know that changes in amphibian populations are often the first indicators that something is wrong in an environment. In fact, as our world becomes more polluted and humans continue to alter our natural environments, amphibians become more and more likely to disappear… forever. Hopefully, our lifeguard made this save in time. And, the last I saw, my charming little froggy friend was nestled high in the leaves of a dogwood tree. But seeing his little face here does remind me to take care when it comes to wildlife and nature… it is all to easy to take what we have for granted. Someday soon, saving frogs may not be as simple as scooping them out of the pool. Author’s Note: My research indicates “gray tree frog” and “gray treefrog” are each used [correctly] to indicate the same animal species. I’ve used the contraction in my text.